The global commercial satellite imaging market has been anticipated by Transparency Market Research (TMR) to demonstrate a fierce competition amongst a few high-potential startups and giant companies such as DigitalGlobe Inc. Among the top reasons for an intense level of competition predicted on the part of the global commercial satellite imaging market could be the decreasing size of commercial satellites and significant developments in high-resolution imagery technology. Emerging companies such as Skybox Imaging Inc., Planet Labs Inc., PlanetiQ, and Dauria Aerospace have been expected to be appreciated for operating CubeSats or smaller satellites, which could create an evolution in the global commercial satellite imaging market. By 2023, the global commercial satellite imaging market has been prophesied by TMR in a market research report to earn around US$6.5 bn. The CAGR that could be borne by the global commercial satellite imaging market is 11.40% for the forecast period 2015–2023. By application, defense and intelligence has been foretold to secure a larger share in the global commercial satellite imaging market. By geography, the global commercial satellite imaging market could witness the dominance of North America which had accounted for a king’s share in the recent past. Owing to the increasing size of worldwide commercial space economy, it has been gaining a telling traction in the present time, much to the advantage of the world commercial satellite imaging market. This could be attributed to the rising investments made by different governments around the globe, resulting into a surge in space program expenditure. Various industries have been looking to proliferate their business presence in the new world of satellite imaging technology. As advanced technologies begin to take shape in the world commercial satellite imaging market, vendors could expect an impressive growth in demand. The broadening scope of applications has also been foreseen to benefit vendors operating in the world commercial satellite imaging market. There could be an escalation in demand for high-resolution satellite imagery promoted by various end users such as national development and environmental protection authorities, national defense organizations, emergency services, and homeland security agencies. The growth of the international commercial satellite imaging market has been envisaged to be encounter challenges on the ground of image resolution. Since satellite imagery falls short of providing higher resolution images compared to aerial imaging services, the demand in the international commercial satellite imaging market could suffer a setback. 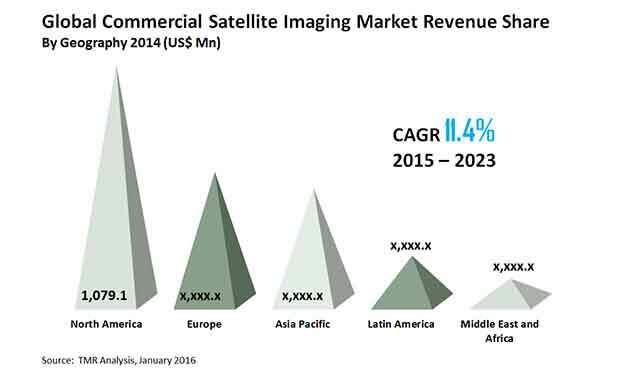 However, the advent of high-resolution cameras, remote sensing technology, cloud services, GPS satellites, and other technological advancements have been envisioned to offer lucrative opportunities in the international commercial satellite imaging market. Government sectors and other end-use industries could be crucial for the growth of the international commercial satellite imaging market, considering their improving consumption rate. Developed regions such as North America have been projected to create ample of opportunities as governments therein support the market with high funding and development of robust technological bases. On the other hand, emerging regions such as Latin America could magnify the demand in the international commercial satellite imaging market while riding on the stable growth of its industrial and agricultural industries.